Anytime I start a new challenge, I love the process of pulling all the possible focals… especially when it comes to my art beads! 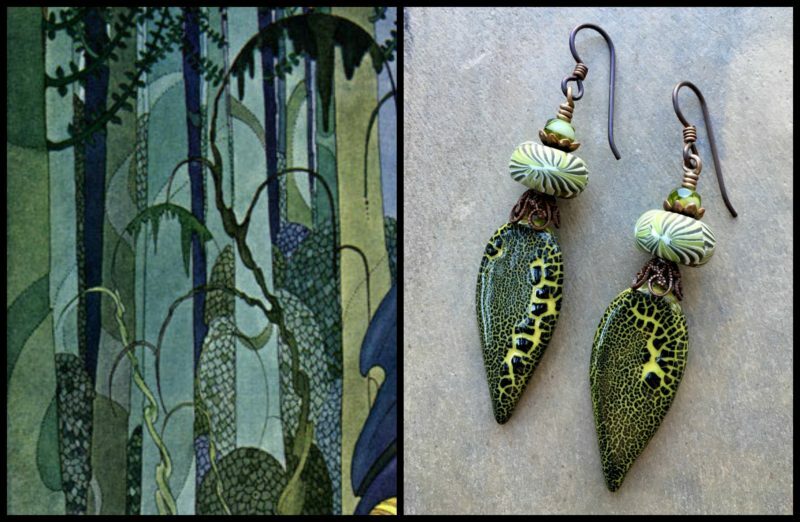 Art Journey Two is no exception as you saw in my last post all about art bead inspiration. 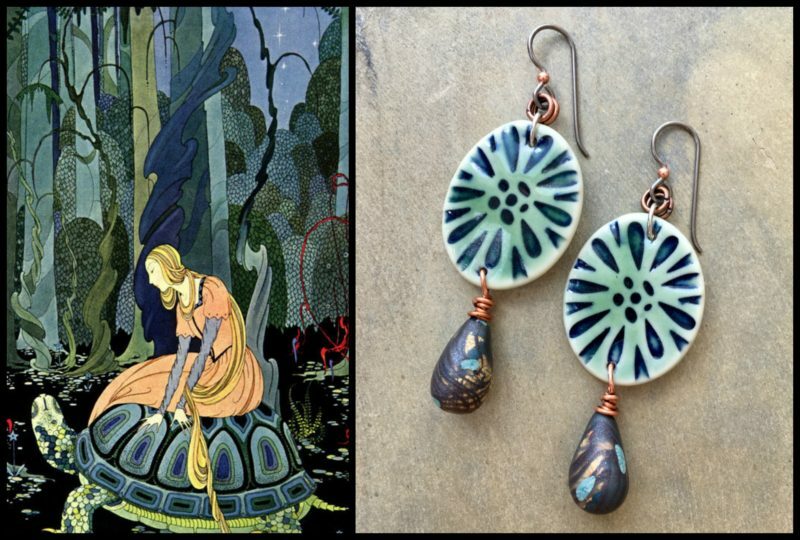 I am so enchanted by the fairy tale illustrations of Virginia Frances Sterrett and hope that I’ve managed to create some enchanting jewelry. Despite the wealth of beads in my stash, something else caught my attention and imagination when it came to Blondine Put Her Arms Around Him. I uncovered a vintage tin that I picked up a couple of years ago but have been too chicken to do anything with… until now. I put on my big girl pants, grabbed my metal shears, and got to work! For now, I’ve only cut the lid apart… I’ve got plenty to work with for a while. The circles in the drapes with their graphic patterns made me think of this vintage tin. 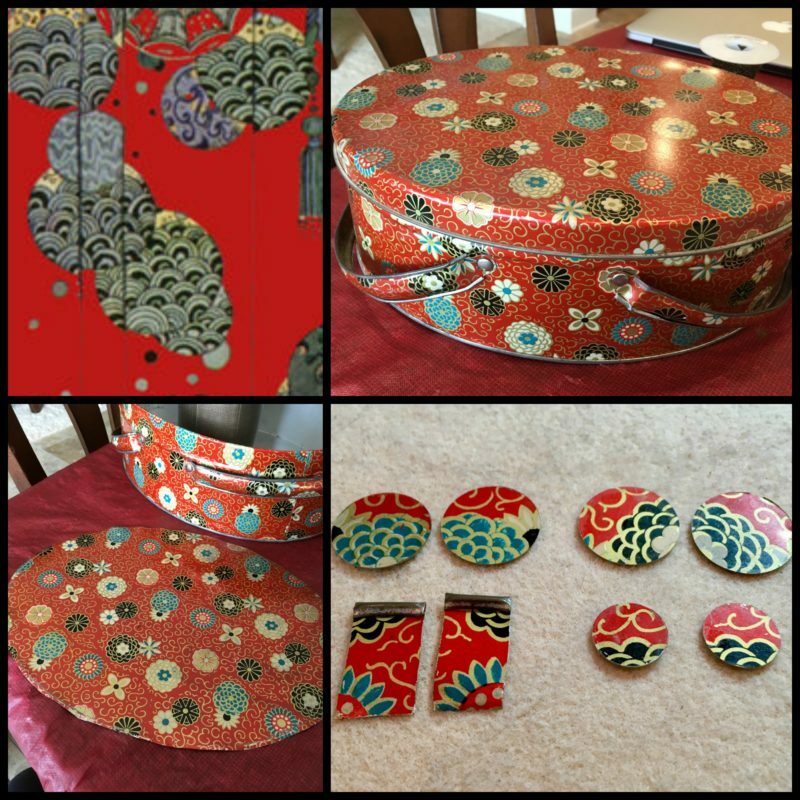 First I cut the edge off the tin’s lid and then I got busy with my disc cutter. 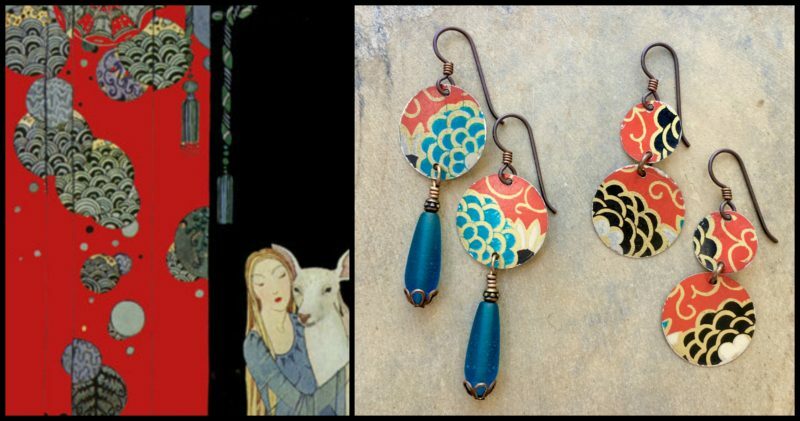 No art beads here… but I love how these two pairs of earrings turned out and can’t wait to play some more with this rich palette of colors! 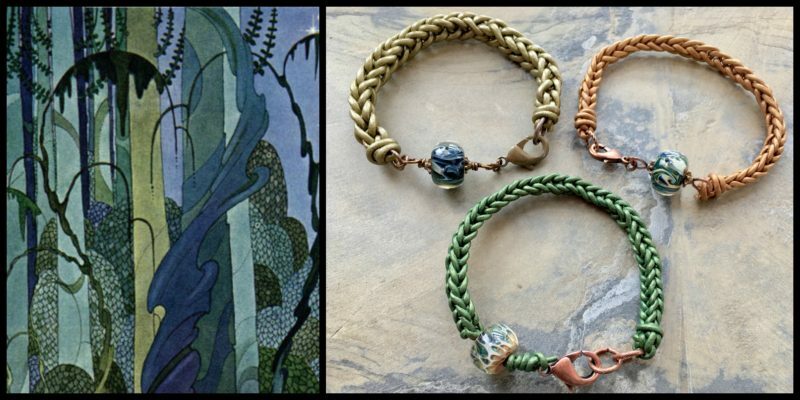 Next I made a series of bracelets combining lampwork glass by Firelily Glass and lucet braided leather. This was a process of problem solving for me trying to get the components to play nicely together. I started with the upper left bracelet using 2mm leather cord for a chunkier look. I was originally shooting for a men’s design, but I underestimated the amount of leather needed. For the upper right hand design, I tweaked the design a little but but still wasn’t totally happy with it. I finally got it right on my third try (at least as far as I’m concerned!) Sliding the lampwork over the leather cord instead of putting it on as a separate link made the difference that I needed. I hope to revisit this design soon before I forget what I did! Zooming into the more textured areas of the background, I picked out some fun crackle glazed ceramic charms by Lesley Watt. Not wanting the earrings to get too heavy, I was lucky to have a pair of Humblebeads discs that paired nicely. Ok, ok… it’s not luck. 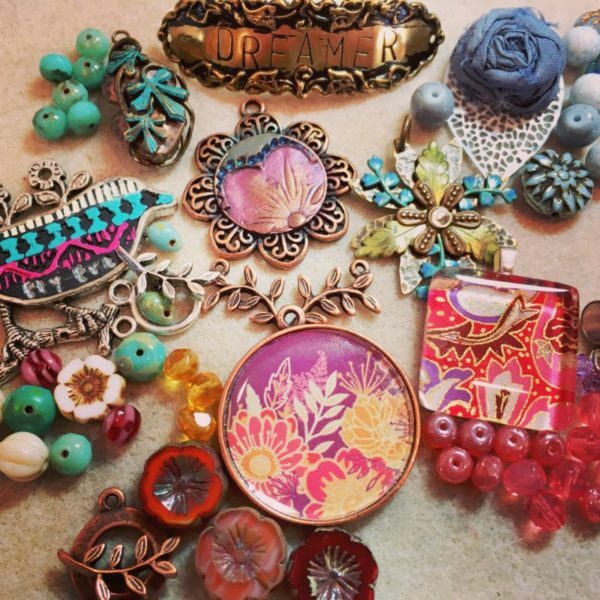 It’s the fact that I pretty much buy every pair of her gorgeous beads that I can get my grubby hands on! Don’t worry, I didn’t neglect Proserpina and the Sea Nymphs. My art bead selections cried out for a necklace design and I chose a polymer clay pendant by Summer Wind Art to anchor my first piece. If I had used this pendant without the influence of the inspiration artwork, I likely would have come up with something fairly monochromatic. 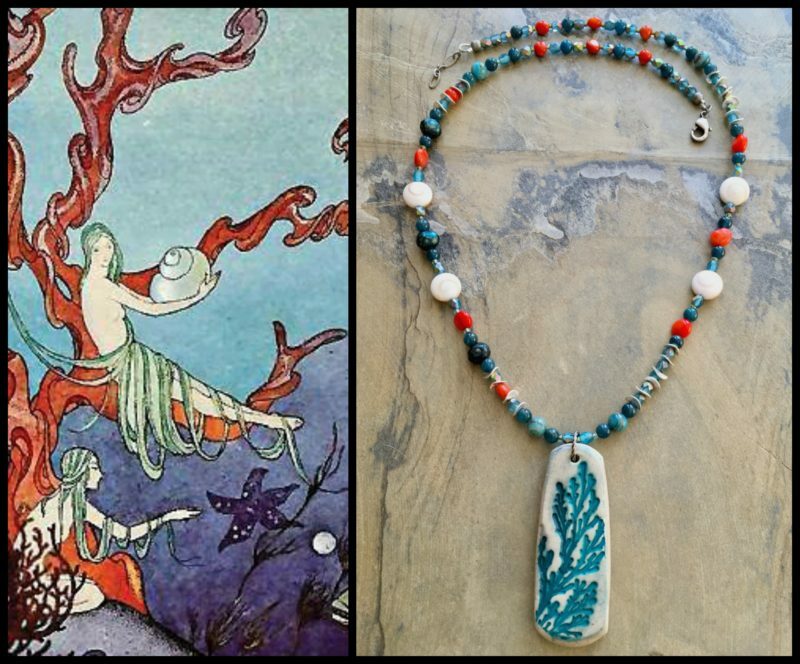 I love that this challenge got me to stretch out of my comfort zone and add in some coral and shell beads to echo elements from the artwork. I just wish that my photos didn’t wash out those shells so much so you could see how cute their swirls are! I kept thinking that I was done designing for this Art Journey and then something else would capture my imagination and I’d think “Just one more!” Thus the genesis of my last two designs. A couple of weeks ago I acquired a few little two-holed shells in roughly the shape of scallop shells from a friend dealing with her late aunt’s bead stash. I kept thinking about them and finally found some Humblebeads discs that worked well with them. 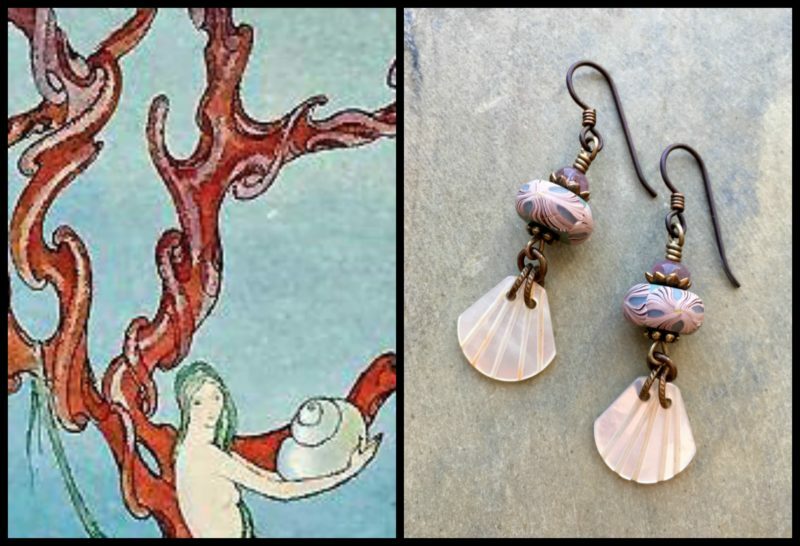 The colors in these earrings pull in the lighter peachy tones from the illustration as well as the shell motifs. Lastly, I just had to make one more necklace! I’ve had this lovely ammonite pendant from Staci Louise Smith since my visit to Bead Fest Philadelphia back in 2015 and it just felt like time to finally use it. 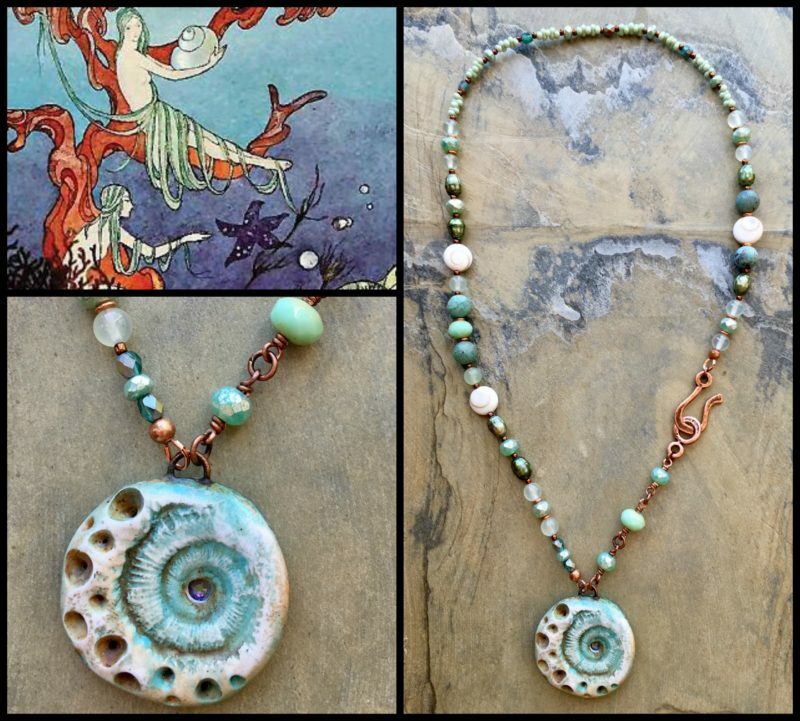 The swirl in the pendant reminded me of the large shell in the nymph’s arms and the holes in the surface of the pendant made me think of the bubbles in the water. I used a mix of shell, faceted freshwater pearls, new Burma jade, matte cuprite, and lots of yummy Czech glass in this asymmetrical design. 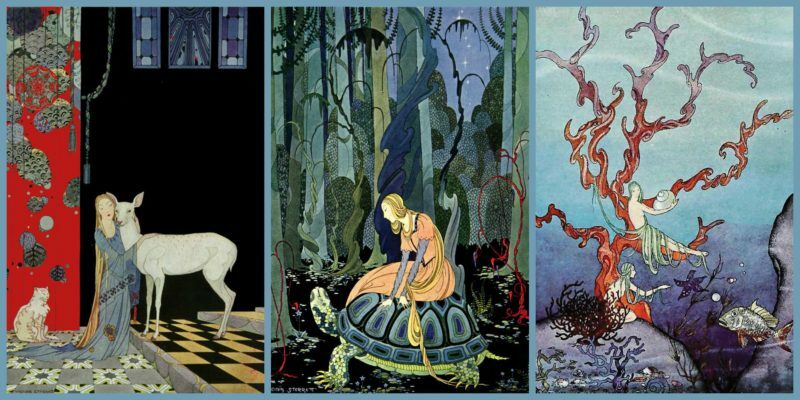 If you haven’t yet designed something for Art Journey Two, I hope that this will inspire you to get creating! The deadline is Saturday, March 23rd. 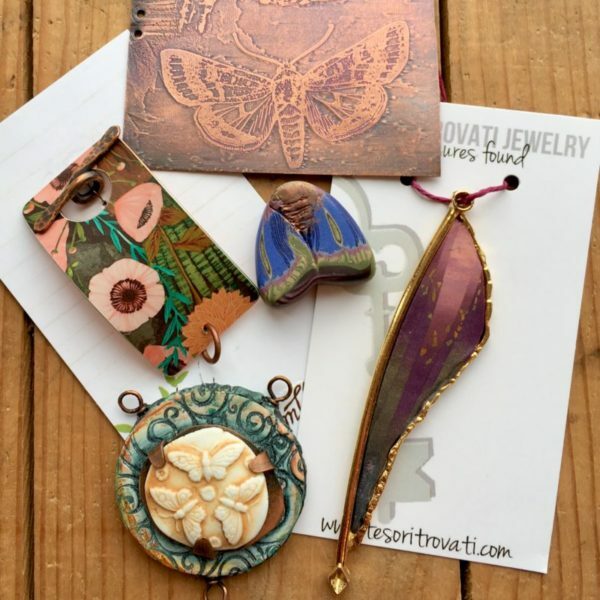 Don’t forget, each time you share your designs in the Gallery you’ll get a chance to win some fabulous items to get you started on the next Art Journey.